Kills eggs, larvae and adult stages of insects. Not for use in food-handling areas. Thorough plant coverage is essential to obtain optimal levels of control. Do not apply to wilted or otherwise stressed plants, or to newly transplanted material prior to root establishment. As with other pest control products, exercise care in timing applications to early morning/late evening to minimize the potential for leaf burn. Use with care on plants with tender tissue. Check for leaf burn in small-scale trials prior to use. Application Instructions: Garden Safe® Brand Fungicide3® is an effective fungicide for the prevention and control of various fungal diseases including black spot on roses, powdery mildew, downy mildew, anthracnose, rust leaf spot, botrytis, needle rust, scab, and flower, twig and tip blight. Garden Safe Brand Fungicide3 may be used on all roses, flowers, houseplants, ornamental trees and shrubs, fruits and vegetables grown in and around the home and home garden. As a preventative, apply Garden Safe Brand Fungicide3 on a 7- to 14-day schedule until the potential for disease development is no longer present. Spray to run off. Complete coverage of all plant tissue is necessary for control. To control disease already present, apply Garden Safe® Brand Fungicide3® on a 7-day schedule until disease pressure is eliminated. Then continue spraying on a 14-day schedule to prevent the disease from recurring. Spray to run off. Complete coverage of all plant tissue is necessary for control. To prevent rust leaf spot diseases, anthracnose and scab, begin applications at the first sign of spring budding. To prevent powdery mildew, apply in mid-summer or when disease is first detected. Continue applications until disease pressure no longer exists. To prevent black spot on roses, begin applications at first bud emergence in spring. Apply Garden Safe Brand Fungicide3 on a 14-day preventative schedule through the spring and fall to prevent disease emergence. Application Instructions: Garden Safe Brand Fungicide3 is an effective insecticide for the control of various insect pests, including whiteflies, mealy bugs, armyworms, hornworms, leafhoppers, bagworms, leafminers, psyllids, fruit flies, loopers, budworms, beetles (including Japanese beetles), aphids, scales, caterpillars, midges, budworms and mites (including spider mites). 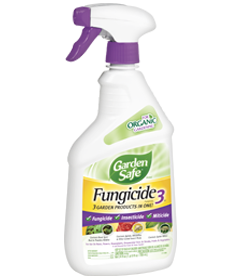 Apply Garden Safe® Brand Fungicide3® at first sign of insects/mites. Garden Safe Brand Fungicide3 is most effective in controlling insects/mites when applied on a 7- to 14-day schedule. For heavy insect populations, apply on a 7-day schedule. Spray to run off. Complete coverage of all plant tissue is necessary for control. CAUTION. Harmful if inhaled. Avoid breathing spray mist. Causes moderate eye irritation. Harmful if absorbed through skin. Avoid contact with skin, eyes, or clothing. Wash thoroughly with soap and water after handling and before eating, drinking, chewing gum, or using tobacco. Remove and wash contaminated clothing before reuse. Prolonged or frequently repeated skin contact may cause allergic reactions in some individuals.